(1868 m) Dogubeyazit is located at the foot of Mt Ararat and close to the Iranian border. It is the place to drink your last beers and to get the latest information about "the other side". For about $500 it is also possible to climb Mt Ararat (5200 m). A good investment if you find Noah's Arc, otherwise... I don't know. We will come back in a few years and then you can probably climb it without an expensive permit. 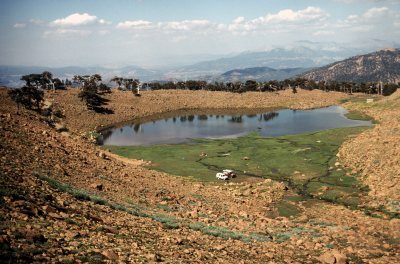 (2275 m) The other Nemrut Dagi of Turkey: a volcano with a height of 3000 meter and a nice lake to swim. (1665 m) Located at the shores of the Van lake (the largest lake in Turkey) and at higher altitude, this is a nice place for a day doing nothing. (1047 m) A beautiful ancient city located on a rock. The mixture of Kurds, Armenians, Arabs and Turks (the last mostly as soldiers or tourists...) gives the city an atmosphere like a Tale of the Arabian Nights. E38�'12.1" Sanli Urfa This are the coordinates of the birthplace of Abraham / Ibrahim. Being a holy city prevents Sanli Urfa not from being terribly hot during summertime. We measured 49篊 - in the shade! Fortunately, aircon hotels costed only 13 euro/dollar a room. (2136 m) One of the high lights of Eastern Turkey is Nemrut Dagi, Mt Nimrod. Located on the top of this mountain is the tumulus (pyramid) of Antiochus I Epiphanes (64-38 BC), accompanied by huge statues of himself and several gods. Together with the superb view, this makes the site an awesome place. It is allowed to camp just below the archeological site, so we did! Info: Read about Nemrut Dagi on the website of The Nemrud Foundation. E38�'2.1" Malatya A long drive from Cappadocia to Malatya. Malatya is a comfortable city and for us a place to do some shopping. E34�'9.4" Soganli (Cappadocia) Soganli means "with onions" in Turkish. A well choosen name because the houses are hewn in the onion shaped volcanic rocks. Besides the houses there are several nicely painted rock-churches dating from the 5th to the 7th century. E34�'19.8" Mazi (Cappadocia) The underground cities of Cappadocia were already described by the Greek historian Xenophon around 400 BC. We visited the city of Mazi, a less accessible and therefor less touristic underground city. In Mazi you realy have to crumble through tunnels and climb vertical shafts, often lighted only by your torch. We stayed more than an hour underground in this huge city, getting a serious Indiana Jones feeling. E34�'13.6" Goreme (Cappadocia) Cappadocia alone is worth a visit to Turkey. The colourfull volcanic landscape, the eroded rocks with bizarre shapes and the odd rock houses and churches makes Cappadocia one of the most beautiful areas in the world. E32�'55.0" Konya Acccording to the Lonely Planet guidebook, Konya is a very conservative city where beer is scarce and where women should cover their heads. Well, the first things we noticed where the large Efes Beer billboards and women dressed leaving not much to imagine. However, during praying time an unbelievable noise is created by the uncountable mosques, proving that Konya is still a religious centre with a rapidly mordernising population. E30�'8.6" Egirdir On the way to Egirdir we visited Sagalassos, a Greek-Roman city located at 1400 meters above sea level. Because the city was abondoned and forgotten after a major earthquake in the 7th century, most of the buildings are still there, although in ruins. The University of Leuven coordinates the excavations and gives excellent guided tours. In Egirdir it was allowed to drive the car on the beach and camp there. More fun than staying in a hotel! Info: Look at Virtual Sagalassos on the website of the KU Leuven. (2321 m) Just after our breakfast a pickup loaded with a Turkish family arrived at our spot. They decided to picknick around us. Time to leave, especially when the women found it necessary to inspect our household. We followed the dirt road uphill, which changed in an awesome rock trail above 2000 meter. The valleys were again very beautiful: steep rock walls, fields with nomad settlements and their livestock, snowfields and lakes fed by the melting snow. Although we camped on a field without a settlement, the nomads dropped by the whole day. Kids to play, men to show their driving skills with a tractor and women to inspect our household. (1677 m) We descended back to Tlos and drove to the Saklikent gorge. A steep dirt road brought us above the gorge (wow!) and to the other side of the mountain range. Via the charming village Sutlegen we finally arrived in Gombe. We camped next to a stream, a few hundred meters above the town. (1576 m) We planned to drive straight through the mountains to Gombe, a small mountain village. However, we ended up in a nomad settlement high in the mountains above the ruins of Tlos. The trail through the valley of the nomads did continue to Gombe, but the trail could only followed by foot. We decided to camp on the mountain and look for another route the next day. E28�'55.9" Koycegiz At three o'clock the head gasket arrived and three hours later the engine was re-assembled. A testdrive and some questions about the torque of the bolts convinced us that the mechanic had done an excellent job. E28�'55.9" Koycegiz We brought our car to the Sanayi, a cluster of repair shops found in every town. The fluid coupling was welded to the drivebelt axis, the radiator was cleaned, the thermostat was tested and a head gasket was ordered in Istanbul. A public bus driver would arrange the payment and delivery of the head gasket. A normal and efficient procedure in Turkey. E28�'27.0" Koycegiz Today we went on an expedition into the mountains with both the LandRover and the LandCruiser to map some trails with the GPS. A beautiful trip, with unfortunately a malfunctioning cooling system of our LandCruiser. The lesson: if you go to the tropics, remove the fluid coupling of the fan. E28�'41.0" Koycegiz The LandRover belonged to Bob and Ingrid of Bob's Adventure who are setting up a holiday resort in Koycegiz. The days in Koycegiz we stayed in a huge appartment of the Su Apart hotel and Bob helped us with the regular maintainance of our LandCruiser: new oil, new drive belts, etc. And of course, we stayed most of the day in the lake or the swimming pool of the hotel. E28�'41.0" Koycegiz This afternoon we faced another drawback of Bodrum as place of mass tourism: our bag with the camcorder was stolen from our hotelroom while we were inside the room! E27�'52.6" Bodrum The harbour of Bodrum is completely adapted to package tourism. However, the museum of Underwater Archaeology, housing in the castle of St. Peter, is great. You can also score another Wonder of the Ancient World: the tomb of King Mausolus - the worlds first "Mausoleum". E27�'56.8" Selcuk (Ephesus) Ephesus is one of the best preserved and restored Roman cities. Unfortunately, all the tour operators are aware of this. Luckily the resort tourists don't like to wake up early and, for some reason, prefer to visit Ephesus midday. Near Ephesus are the remains of the temple of Artemis. A stork family nests on the single column that is left of this Wonder of the Ancient World. E27�'1.1" Pergamum A Greek-Roman city dating from the 3rd century BC to the 1st century AC. Situated on a hilltop with a superb view. Today Brazil disturbed Turkeys dream about the World Cup soccer final. E26�'42.7" Ayvalik Ayvalik is a nice harbour town with not so many tourists (yet). You can make a boot trip and visit uninhabited islands nearby. Do not forget your snorkling gear as we did - colourful fish are everywhere. We stayed in the pension Taksiyarhis, mentioned in the Lonely Planet as "Turkeys most charming pension". Yes it is charming, but also incredible noisy: because of the narrow streets every scooter passing by sounds as if it is driving in your bedroom. E28�'24.5" Istanbul Three weeks on the move! E26�'10.9" Border Greece - Turkey The first serious border crossing. A bit chaotic office at the Turkish side but within 40 minutes we collected all the necessary stamps and papers.